If Miss Bates could hand out book prescriptions as doctors do medicine, Marion Lennox would go on every prescription pad entitled comfort read. A Lennox romance offers a view of the world that says kindness and care are what make it better; everyone is capable of changing to be able to love; grace and consideration are virtues to look for in a mate; and the genre can be sweet, funny, tender, and true, without being saccharine. Lennox’s The Billionaire’s Christmas Baby does this by bringing a baby and unlikely hero and heroine together at Christmas. Lennox’s romance is the Cinderella-troped story of the aptly-named Sunny Raye and equally allegorically-named billionaire Max Grayland as Sunny sheds love’s light onto Max’s loveless, lonely existence. The two of them are redeemed and love made possible by the appearance of one newborn bundle of cuddly joy and screaming-like-a-banshee set of lungs baby, Phoebe. One of the things Miss Bates loves about Marion Lennox’s romances is how kind her characters are and yet still often hurt others. Because that’s what we do, an unkind word, a slip of the sarcastic tongue, a nay in place of, with a small giving of self, what could be a yay. But Lennox also understands and sympathetically portrays what that yay might cost, what vulnerability, uncertainty, and fear have to be overcome to reach assent. Lennox’s Stranded With the Secret Billionaire, and this review’s subject, is a book illustrative of this theme and characterization. Miss Bates often wonders who can ever succeed Betty Neels in the rom-reader’s world of comfort reads? 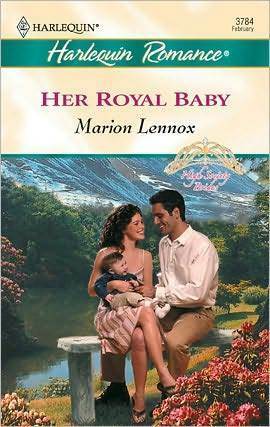 With every Marion Lennox she reads, she inches towards thinking that it might be Lennox. Not that Neels and Lennox have everything in common, but they do share in the decency, good eats, animals, and pathos of the worlds and characters they create. These elements are present in Lennox’s Stepping Into the Prince’s World. And like last year’s Saving Maddie’s Baby, there’s much to love. Heroes and heroines don’t choose to be brave, Maddie decided. Mostly they have bravery thrust upon them. In her particular case, a heroine was created when vast chunks of rock trapped one doctor in an underground mine, a mine she should never have been near in the first place. This heroine wasn’t brave. This heroine was stupid. And with that rueful opening, Miss Bates had to forgive the TSTL heroine because she was thoroughly engaged in Lennox’s re-united-husband-and-wife medical romance. Charming cover: check out Tammy’s flipflops!